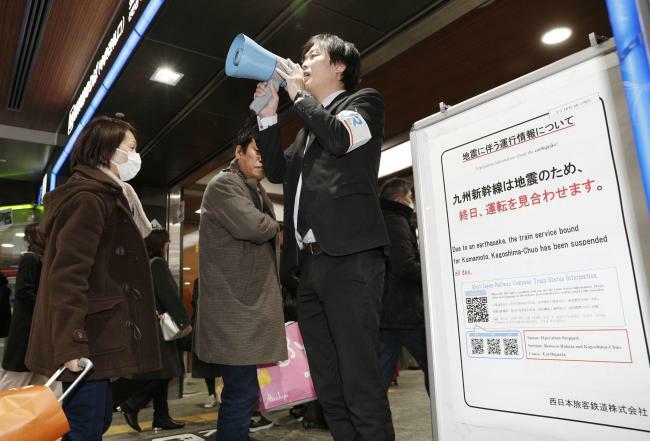 TOKYO -- An earthquake shook southwestern Japan on Thursday, but there were no immediate reports of damage and a tsunami watch was lifted within an hour. The Japan Meteorological Agency said the quake measured a preliminary magnitude 5.0, rattling the Fukuoka, Nagasaki and Kumamoto areas in the southwest of the main island of Kyushu. Government spokesman Yoshihide Suga said an emergency team was set up to check on any damage. At his second news conference two hours after the quake, he said no deaths or injuries had been reported and no emergency calls for firefighters or other rescue had been made. The two nuclear plants in the area had been confirmed as operating regularly, and Kumamoto airport, which had been temporarily shut down, was back up two hours later, and bullet train services were halted but being readied to resume, Suga told reporters. After quakes, tracks and runways are checked for safety. Power, water and mobile phone services were also working, Suga said. National broadcaster NHK TV warned people to stay calm and watch against dangers such as shaking, mudslides and items falling from shelves, as well as aftershocks. TV news footage showed that traffic lights and other lights the buildings were working, and pedestrians on city streets were walking about as usual. Japan is one of the most earthquake- and tsunami-prone areas in the world. Kyushu was struck by a series of earthquake in 2016, which smashed homes, warped roads and damaged a castle in the area, leaving nine people dead and more than 800 injured. Thousands of people were evacuated.